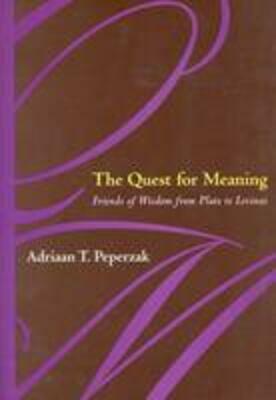 One of our most distinguished thinkers, Adriaan Peperzak has masterfully explored the connections between philosophy, ethics, religion, and the social and historical contexts of human experience. He offers a personal gathering of influences on his own work as guides to the uses of philosophy in our search for sense and meaning. In concise, direct, and deeply felt chapters, Peperzak moves from Plato, Plotinus, and the Early Christian theologians to Anselm, Bonaventure, Descartes, Pascal, Leibniz, Hegel, and Levinas. Throughout these carefully linked essays, he touches on the fundamental ideas-from reason and faith to freedom and tradition-that inform the questions his work has consistently addressed, most specifically those concerning philosophy as a practice.